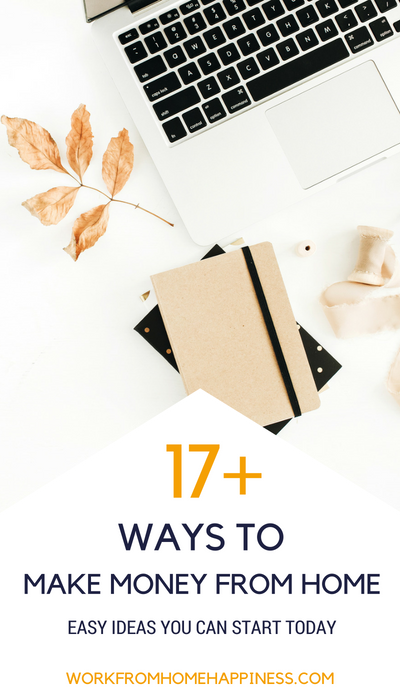 Ways To Make Money From Home - 17+ Ideas You Can Use Today! I’ve been researching ways to make money from home for the better part of a decade now. In that time, I’ve come across A LOT of options. Believe me, I know. In the last seven years, I’ve made money from home as a freelance writer, typist, proofreader, and virtual assistant. I’ve also tried my hand at many different side hustles and ways to make extra money online. The good news is, if I can do them, so can you! That’s why I’ve put together a list of ways you can make money from home — starting today! No excuses. The hardest part about earning money from home is actually getting started. And these ideas make it simple to do just that! Great at getting things done? Master of to-do lists? Put your productivity prowess to work as a virtual assistant! Commonly called a VA, a virtual assistant helps busy professionals get more done in a day. The services a VA offers depends on the clients they work with. For example, a VA who works for bloggers may offer blog post writing, graphic design, and social media promotion services. But that’s just a drop in the bucket of potential ways to earn big as a VA. Here are 150+ VA services you can offer for extra inspiration! Great at spotting errors? Frequently find typos in everything you read? You’d probably make a great proofreader! There’s a lot of content out there. From print materials to websites (and everything in between), you can carve out a nice little niche for yourself in the world of proofreading. Heck, my friend, Phon, made a living proofreading romance novels! Curious if you have what it takes to turn your eagle eyes into a money-making home-based career? 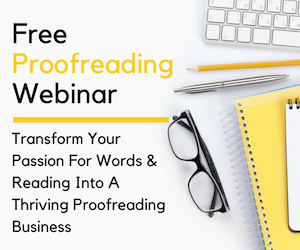 Start with this free 45-minute webinar to find out what it takes to be a successful proofreader (and whether you’ve got the skills to get started). Content is king, or so the saying goes. And, because of that, there’s a HUGE demand for writers. That’s exactly how I got my start with ways to make money from home. There are many different paths you can take to become an at-home writer. From blogging for profit to content mills and even starting your own freelance writing website, there is no right or wrong way to get into the world of freelance writing. But, if you’d like to learn how you too can make your first $1,000 as a professional writer (even if you have absolutely zero experience), I highly recommend the self-paced online course, Write Your Way To Your First 1K. Even though speech-to-text technology is getting better all the time, there’s still a need for talented typists to put the spoken word into writing. That’s where transcriptionists come into play. As a transcriptionist, you listen to audio recordings and transcribe what is being said. This could be an interview between two people or a focus group session with several participants. 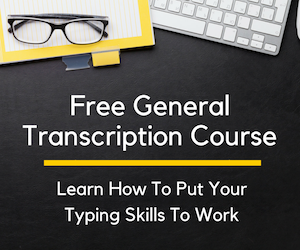 Try your hand at typing for a living by signing up for this free 7-day mini course over at Transcribe Anywhere. You’ll be one step closer to finding out if you’ve got the chops needed to be a successful at home-typist. There are a lot of ways to make money from home. And, one you’ve probably never heard of before is scopist. “What’s a scopist,” you ask? Great question. A scopist edits court reporter transcripts (you know, those highly-skilled pros who type out court proceedings in real time!). Well, after a court reporter transcribes court proceedings, a scopist edits it to make it more readable. Sound interesting? It is! Learn more about it over at Internet Scoping School and sign up for their free introduction course to dive right in. You probably buy a lot of stuff on Amazon if you’re a Prime Member. If not, give it a try, you can sign up for a free 30-day trial here. But, did you know you can also sell stuff on Amazon? When you become an Amazon FBA Seller, you too can set up shop on one of the world’s largest Ecommerce sites. Some Amazon FBA sellers earn well into the six and seven figures every single year! You can too. But first, you’ve got to get started. A great resource for anyone looking to start selling on Amazon is The Selling Family, where they show you, step by step, how to successfully sell on Amazon for the first time. Number lovers will no doubt enjoy the world of virtual bookkeeping where you can immerse yourself in record keeping for different businesses! And, before you even ask, you don’t need professional experience or special credentials to be a successful bookkeeper. However, it will help to have a little training under your belt. That’s where Bookkeeper Business Launch comes into play. Take part in their free 3-part video training series to find out how you too can become a bookkeeper as a beginner. From looking on LinkedIn to scouring social media, the world of recruiting is often done virtually these days. Finding top talent is just a small part of being a successful recruiter. You also need to make connections, know the ins and outs of hiring and help place candidates with the right companies. To do this, you’ll need a ton of people skills and a strong online presence to network with candidates and hiring managers. Love Law & Order and other legal dramas? Perhaps a career as a legal typist might be right for you! A legal typist might listen to a recorded deposition or interview and transcribe verbatim what is being said. Verbatim typing requires a little more skill because you have to pick up every single um, uh, and er — no matter what. Learn more about what it takes to become a legal typist when you sign up for the free legal transcription course over at Transcribe Anywhere. When you go visit your doctor, he or she might dictate notes into a tape recorder. Eventually, these notes are transcribed and become a permanent part of your medical records. That’s where a medical typist comes in. Medical typists listen to dictation and type out what is being said. Sometimes, medical typists might even edit speech-to-text documents to ensure accuracy. Either way, you can learn about medical typing and transcription editing over at Career Step, where they have an in-depth training program you can complete in under a year. I’ve tried a lot of ways to make money from home. Currently, I’m a blogger! And you can be one too. Bloggers earn money from their website in many different ways. Ad sales, affiliate marketing, and digital products are some popular ways to make money from home as a blogger. But to become a blogger, the first thing you have to do is set up a blog. Don’t worry, it’s much more affordable and simpler than you might think! Use this no-fail beginner’s guide to get started today. 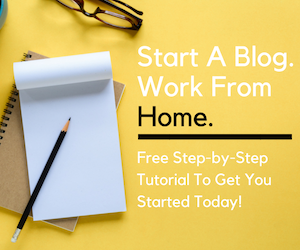 You’ll be one step closer to become a home-based blogger. Search engines like Google and Bing aren’t perfect. At least, not yet. In the meantime, developers use humans to help make search engines smarter and more intuitive. There are a number of companies that offer ways to make money from home as a search engine evaluator. The work is typically part time and can earn you extra income each month to steady part-time wages. Okay, so you won’t get rich taking surveys. But, as far as ways to make money from home, it doesn’t get much easier than survey sites! Some survey sites pay by points and others cold-hard cash. My favorite? Vindale Research. They send you a check or PayPal payment anytime you cash out with $50+. And, they’ll even send you an email to let you know whenever a survey is available that fits your demographics. Simple, right? Moms are often looking for ways to make money from home. But kids making background noise can make it difficult to find work. Not with phone mystery shopping! As a phone mystery shopper, you call up businesses and ask a series of questions. You’re judging the phone call on a number of different criteria. The best part? You can have background noise! Check out these companies that hire phone mystery shoppers to get started. Great at something? Chances are, you can freelance it! As a freelancer, you offer services for sale. A service can be anything from editing a document to designing a logo. Really, it’s up to you to decide what service you want to sell. Once you’re ready to get going, you can use one of the many freelance marketplace sites to market your services or create a freelance service site that sells for you. Pinterest is huge! And because of this, so many businesses and brands turn to Pinterest for promotion. But, Pinterest also takes up a lot of time. That’s why these same businesses are willing to outsource the work to a Pinterest Assistant, like you. Becoming a Pinterest Assistant is one of the ways to make money from home in marketing and social media. And, if you love to pin, this could be a perfect gig for you. There’s no denying the power of Facebook. People use it every day to interact with brands and catch up with friends and family. Because it’s so powerful, Facebooks Ads are often used by businesses to get their name in front of new customers. But understanding how to set up a successful Facebook Ad campaign is no easy task — unless you know how to do it. The good news? You can learn how to become a Facebook Ad Pro and start this successful side hustle that can lead to thousands of extra dollars each month! There are a lot of ways to make money from home in customer service! A lot of companies regularly hire remote customer service representatives. You can answer general questions about a product or service or help troubleshoot an issue a caller is having. Not a big fan of phone work? No problem! There are also ways to make money from home as a chat agent or email support rep! Looking for a remote-friendly healthcare career? Become a home-based medical billing and coding pro. This in-demand career is full of opportunities. But, keep in mind, you will need training in order to become a medical billing pro. The good news is, CareerStep offers an online program that can have you seeing graduation in about a year! Remember, this s just a short list of ways to make money from home. Today, there are a growing number of opportunities to earn extra cash to full-time income from the comfort of your home office. Be sure to check out some of the more popular remote career paths for even more inspiration!